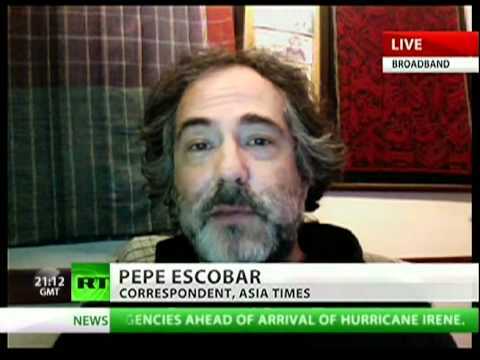 See this breaking news interview with War correspondent Pepe Escobar on Russia Today television. The hostility persists in Tripoli and the Libyan rebels continue the search for Gaddafi, but who is leading the rebels? Who are the beneficiaries of the fall of Gaddafi? What will the blowback be for those in Libya and across the globe? Pepe Escobar, a correspondent for Asia Times, gives us some answers to these questions. In this interview with Pepe Escobar is discussing the situation in Tripoil and how the current actions by NATO is a complete violation of the UN resolution. He then reveals how the leading commander of the rebels in Tripoli is an Al Qaeda asset. Things have got so blatant at this point that even the mainstream press are now beginning to report this and he says the Obama administration have already started the process to try and publically try and distance themselves from this guy even though the US military is providing drones, missiles, battlefield systems, air support, and intelligence to these same people alongside NATO. There has been a tendency on the entire Left when they here the word Al Qaeda to run away, but it has become undeniable that the US and NATO forces have deep links with this murky complex of various terrorists groups and they fight them in one place when it suits and ally with them in another when it suits. People should remember that during the war in Bosnia, when the West sided with the muslim side, they openly had former Mujahideen fighting for them. Many of these were the early people of the Al Qaeda brand. Meanhile in Libya, the situation has descended into chaos and the rebels are taking out revenge on people. NATO have a lot of blood on their hands here. Source at I find it very ironic that David Cameron took about the people rioting in London and yet British Special Forces (SAS) are in Libya along with their airforce and they are blowing up infrastructure and launching bombs and missiles and you can be sure civilians are getting killed. Collateral murder. There are massive shortages of fuel and medicines in Tripoli as we speak and the population is terrorized. The Antiwar.com radio site carries an interview of Pepe Escobar which covers some of the material discussed above and how within 2 days of the Libya TNC declaring victory they had met with Italy's Berlusconi and the head of the Italian oil comapny ENI was there. Escobar sees this more as a French led than than other commentators would suggest but I think there are so many things happening here and so many agendas at play it depends on what one area you are focusing on where the different strengths come in. He goes on to discuss the ragbag elements of Al Qaeda andhow the leading commandor of Tripoli forces came to this situation. Now that this is out in the open Reuters and other newsagencies are carefully distancing the UK and US administrations but this is purely in the context of we get let these guys rule, so we need to put Western troops in there to control the situation. Escobar reckons this is the lead up to the justification to put the UN in and there are already 1000s of troops and mercenies ready to be deployed from Qatar who have played a large financial role. Indeed some of the rebels who landed by ship last week ere transported from there. He reports that Blackwater had been training some of the rebels in Qatar for the last two months and now they have others there who will probably be part of the occupation. There are former South African mercenaries and members of Columbian dead squads amongst their ranks. Escobar goes on to explain how Libya is being raided as it has some of the biggest oil reserves in Africa (as opposed to Arabia), then there is the 'Great Man Made' river that cost $35 billion over the years financied by the Libyann government. This pumps freshwater from ancient aquafiers that were found decades ago under the desert, and is pumped to the cost. Some of the biggest water companies in the world which happen to be French have their eyes on privatising this. There is also a few hundred tonnes of gold, and Libyan soverign reserve fund of approximately 150 billion Euro. Near the end of the podcast Scott Horton and himself point out the ever so lucky coincidence that ever since Osama was killed this essentially brought an end to the justification for the War on Terror and lo-behold now pops up some more evil types because they both foresee Libya descending into chaos once all these rebels fall out and the hard-core Islamits who want Sharia Law, will effectively start their own Libyan version of the Taliban and what do you know, the War on Terror will have to continue.